One of the BNK48 member, Kaimook uploaded a romantic photo with the AKB48 Team SH members. 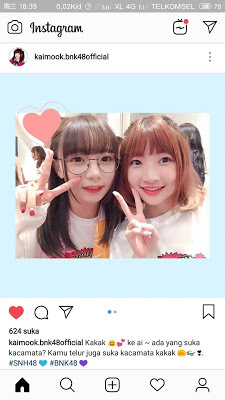 The photo was taken when both of them participated in the 2019 AKB48 GROUP Asia Festival concert in Impact Arena, Bangkok on January 27, 2019. However, this cute girl mistakenly wrote the hashtag so she had to edit the writing. In the photo she uploaded, she appeared to take a selfie photo with Shen Ying Team SH. However, the hashtag given is not # AKB48TeamSH but the former AKB48 # SNH48 sister group. Interestingly, the # SNH48 hashtag was quickly edited by Kaimook herself because she was warned by fans through the comments column. This shows that BNK48 members know about SNH48 including Cherprang who previously admired SHY48 members through Instagram account.